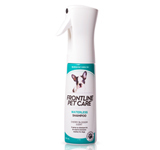 95% of the flea problem is in your pet’s home environment as eggs, larvae and pupae! Your pet’s coat is a great place to hide. Fleas can be hard to detect as they move so quickly. It’s often easier to spot the black grit, or flea dirt, that they leave behind rather than the fleas themselves. In sensitive dogs and cats, fleas can also trigger an allergic condition called flea allergy dermatitis (FAD), a skin disease that is intensely itchy and can result in hair loss and lead to infections and sores on the skin. 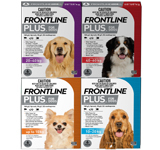 You need to eliminate all stages of the life cycle to get rid of fleas from your pet and your home. 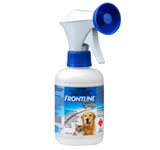 FRONTLINE PLUS for cats and dogs kills all 4 stages of the flea life cycle, to kill fleas and help prevent infestations. Start early, as soon as you bring a puppy or kitten into your home, treat all cats and dogs you may have and ensure they are treated all year round. Flea eggs represent about one-half of the entire flea population. They fall off pets as they move, scattering eggs in the environment wherever a pet goes. Larvae make up about 35% of an infestation. After hatching from eggs, larvae hide - in dark places, deep in carpet or in cracks in flooring where they feed on flea dirt. They grow and then spin cocoons where they develop in to pupae in a protected environment. Pupae account for about 10% of a flea infestation. Pupae are very well protected in their cocoons and virtually indestructible - waiting for the right signal that it's time to emerge as an adult flea. Adults seen on your pet represent just 5% of the flea population. Signals, such as a pet walking by or people moving in the house, alert adult fleas to leave their cocoons and jump onto the pet to feed and mate, starting the cycle all over again. Adult fleas typically stay on their host until they die.